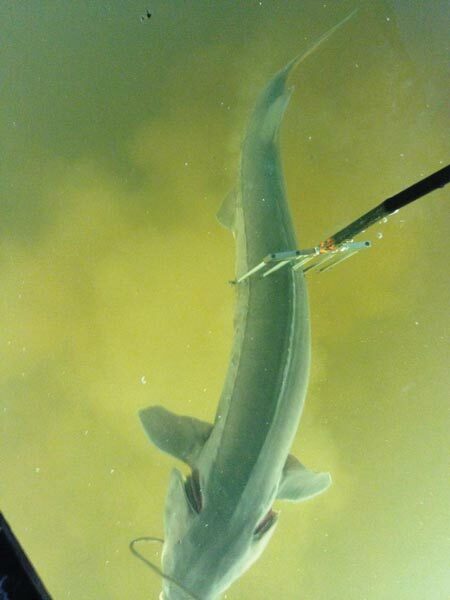 Most Wisconsinites have heard of and know something about sturgeon spearing on Lake Winnebago and the upriver lakes. Whether you have seen it, done it, or read stories about it-there is surely some common knowledge amongst sportsmen of this somewhat mythological season. However, there are a number of you out there that are, as of yet, unfamiliar with sturgeon spearing, not to mention its draw, uniqueness, and history. 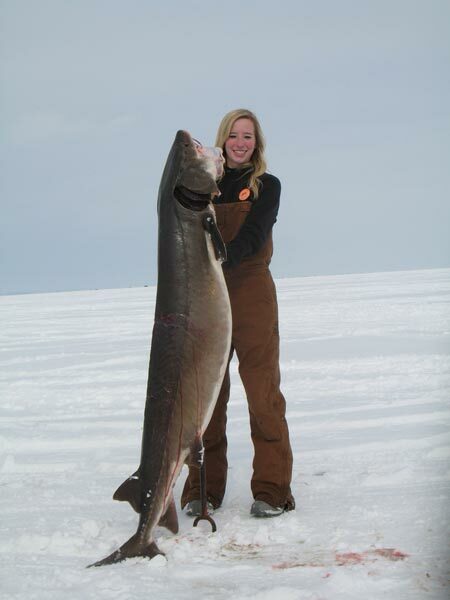 Sturgeon spearing is a great tradition in Wisconsin (and especially in the Lake Winnebago region). While the sport and season are known entities to most Wisconsinites, the history of it and work that goes on behind the scenes is both impressive and necessary to keep this “jewel of Wisconsin” at the luster it now maintains. Sturgeon spearing has gone through many evolutions over the past 40+ years. Changes to season length and spearing hours, license sales, use of hook and line, decoys, and instituting harvest caps are some of these evolutions. Things, as always, change. But, while technology, rules adaptations, better winter gear and a better understanding of these pre-historic fish have made the “spearing” aspect more accomplishable, the uniqueness and singularity of it is truly what sets it apart. As the years go by, sturgeon spearing and its foundation stand still making it the, “most pure and level playing field outdoor pursuit in fishing or hunting,” according to Paul Muche, Treasurer of the SW chapter of Sturgeon for Tomorrow. Sturgeon spearing, much like deer hunting, is a tradition for those that have been a part of and watched the sport continue over the past 40 or so years. The difference is that, unlike deer hunting, the opportunities have gotten better over time to the point that RIGHT NOW is THE time to get on the ice in search of a record sturgeon. Even if you don’t have a license to get one yourself (license registrations are due in October), just being on the ice and a part of the tradition is worth the effort. It hasn’t always been this way- as the sport has gone through many changes over the years, arguably, each of these changes have been for the betterment of all involved-including the sturgeon. The Badger Sportsman team recently had an opportunity to meet with members of the board from the Southwest Chapter of Sturgeon for Tomorrow. The biggest message that was abundantly clear and was said with real energy was that the excitement and anticipation in and around opening day sturgeon spearing was indeed the greatest part of the season. That came in contrast to what we thought they would tell us was the most exhilarating, and that is actually spearing a sturgeon. To follow the energy that was evident in describing the days leading up to the opener, we were told there is a definite, “buzz around the lake,” as people get ready, cut holes in the ice, set-up shacks, and get together to discuss “strategy” and a game plan. Second to the excitement of opening day and preparations are the memories that are made each and every year. As mentioned, the real story of the sturgeon spearing season is the anticipation, camaraderie and tradition that can be found right here in our, Wisconsin’s “back yard.” Right here in Wisconsin, on Lake Winnebago and the upriver lakes, we have the truly unique opportunity to experience something that very few in the world will ever get the chance to experience. If you have never come to the lake during sturgeon spearing-this is the year to do it. There are countless registration stations, bars, and restaurants that are greatly involved in the season. One of which, and a very well-known destination, is Wendt’s on the Lake on the southwestern shore between Oshkosh and Fond du lac. Here, at Wendt’s, you can see the usually still breathing (yes, still breathing even after being speared, drug out of the water, hauled on a tailgate and PLUNKED on the registration table) pre historic and HUGE torpedo-like sturgeon. That sight- in itself- is worth the drive and visit to see. While the sights and images of the season alone are incredible, there is much work that goes into keeping this unbelievably unique season and tradition alive from year to year. The season is in no small part thanks to the efforts of guys and gals like those connected to Sturgeon for Tomorrow as well as many other clubs (including Walleyes for Tomorrow and others) that work together in donating time, energy, and funds to protect and grow the sturgeon population on Lake Winnebago and the upriver lakes. For example, those that are board members, members, or interested parties associated with Sturgeon for Tomorrow and other clubs have given back in excess of one million dollars in donations to see the sturgeon survive, prosper, and get to the level we have now. That is and will hopefully be a level sustained for years to come. One of the most impactful of the projects and donations the Sturgeon for Tomorrow clubs have undertaken is establishing a “Sturgeon Guard” on the tributaries along the Wolf River. The Sturgeon Guard ensures that sturgeon are not illegally harvested or disturbed when they are at their most vulnerable- which is during the spring spawning runs. The Sturgeon Guard works 24 hours a day (with all expenses, lodging, meals, etc. paid for by Sturgeon for Tomorrow) to make sure that the sturgeon are not taken or harmed in any way. Years ago, poachers would, “load up pick-up trucks in the spring with sturgeon.” As a matter of fact they could just, “reach in the water and pull ‘em out. They would stack ‘em up like cord wood and then sell both the flesh and caviar,” according to Tim Michels from Sturgeon for Tomorrow. The institution of the around the clock sturgeon guard has done wonders for the sturgeon population and further has changed the mindset of local residents to turn in those that illegally take sturgeon from the shallow waters. Another great result of the increase in regulations and protection of these fish is that according to Jim Patt, “years ago you would see one or two 100 lb. sturgeon speared. In recent years there have been over forty 100 pounders taken each year.” The increase in regulations, donations, time and effort to preserve this great tradition and spearing season have done wonders in the right way. The season has not only been preserved over the years, it is flourishing thanks to the conservation minded individuals that had the foresight to establish Sturgeon for Tomorrow in the 1970’s and those that remain passionate and involved today. As we continued to discuss the sturgeon spearing season we also learned a lot of little known facts regarding the evolution of the sport, its true uniqueness, the passion and tradition it has for those that come back to it year in and year out. Some of the evolutions and events may be common knowledge, while others are quite interesting and also somewhat comical. One remembrance was that there was a period of time when it was legal to catch and spear a sturgeon by use of a hook and line. It wasn’t too much of an issue until 1992, when it became a real advantage when water clarity was down to about 18 inches. And it was really only utilized by a few sturgeon spearers (those in the ‘know’). But once the secret was out that it was legal… and worked well… it quickly got out of hand and the result was that hook and line was made illegal. As was elaborated on, the sport aspect was taken out when, “Guys would use broom handles and Penn reels and play cards while watching bobbers, then hook into one, bring it to the surface and then spear it.” According to board member Tim Michels. This was deemed to be illegal after much discussion between the sturgeon advisory board and the DNR. And while this tactic is still illegal, there is some desire for it to be allowed once again for various reasons. Stay tuned. There was also a time period where the season ran for 24hrs. Which initially really wasn’t a big deal as there were only a handful of guys that would use lights and stay out at night. But, once word got out and hundreds of guys started to sturgeon spear at night, it was too much. The DNR wasn’t able to regulate it and it too was made illegal. With that, the spearing hours soon came to a close at 1 pm. While this was a change, in many ways it was a change for the better and most, if not all, sturgeon spearers would probably agree. The early end time allowed the rest of the day (including daylight hours) to patronize local bars and restaurants, shops, stores, and have to time to move shacks to “a new hotspot” at a much safer hour than at night. Again, a win-win. It was a great move for the economy and fishermen alike. The early end time also made a great impact on the season being about tradition, friends, and family as there is considerable time to spend talking about the day, making plans for tomorrow, and reminiscing about past seasons as well. These are the aspects which are the true infectiousness of sturgeon spearing. So, while many people have heard of and know at least something about sturgeon spearing, it is only thanks to the work of dedicated individuals that the season has continued and grown over the last 40+ years. If you have time to come to Lake Winnebago and a sturgeon registration station like the one at Wendt’s, take the time to do it. You won’t regret it. And next year, be sure to get your license in October to give yourself a chance to really experience the season and all it has to offer. We wish all sturgeon spearers, their families, and dedicated sportsmen that have donated time, money and effort to keep the sport the “hidden gem of Wisconsin” it is, the best of luck and continued safety this season.